Mexico City, Mexico, Dec 11, 2018 / 03:47 pm (CNA/EWTN News).- It would be virtually impossible to travel to Mexico without seeing the colorful, star-cloaked, Satan-snake-crushing image of Our Lady of Guadalupe on street corners, in private homes, on restaurant walls, and certainly in church chapels. Four hundred and eighty seven years ago, the Virgin Mary appeared multiple times to St. Juan Diego, an Aztec convert to Catholicism, in his native Mexico. The Mestiza Mary, who became known as Our Lady of Guadalupe, spoke to Juan Diego gently as a mother, and in his native language. On December 12, in her last appearance to Juan Diego, she ordered him to gather the unseasonable roses from the top of a mountain in December, and bring them to the bishop as proof of her request to have a church built there. When Juan Diego let the roses fall out of his tilma, the miraculous image of Our Lady of Guadalupe appeared imprinted on his tilma, and the bishop was convinced. “Pretty much if you’re Mexican you are Marian, devoted to Our Lady,” Deacon Jesus Valenzuela, F.S.S.P., a seminarian from Mexico at Our Lady of Guadalupe Seminary in Nebraska, told CNA. But while she is originally from Mexico, her patronage and devotion has spread throughout the Americas, and beyond. Monsignor Eduardo Chavez, postulator of the cause of St. Juan Diego and a Guadalupe apparition expert, is not surprised that devotion to Our Lady of Guadalupe has grown strong in the United States and throughout the world. “In 1531, there were no borders in the Americas. But, just in case we need clarification, the Virgin herself says to Juan Diego ‘and of all the other people of different ancestries who love me.’ Then from the Virgin of Guadalupe herself it is declared that she is not only for Mexicans but for the whole world,” Chavez told CNA. The Virgin of Guadalupe transcends cultures and countries because she comes bearing Christ, Chavez added. In 1910, St. Pius X named her Patroness of Latin America, and in 1945, at the urging of bishops from the U.S. and Canada, Ven. Pius XII bestowed on her the title Empress of the Americas. “Empress is perhaps the most impressive title as it is limited to a small number of the leading Marin advocations across the globe, none of whom lay spiritual claim over two continents as is the case with the Virgin of Guadalupe,” Andrew Chesnut, Bishop Walter F. Sullivan Chair in Catholic Studies at Virginia Commonwealth University and specialist in Catholicism in Latin America, told CNA. Later, St. John Paul II formalized the invocation of Our Lady of Guadalupe as Patroness of the Americas and Star of the New Evangelization. In 1999, he declared that her feast day of Dec. 12 be celebrated in churches throughout the Americas, and in 2002 he canonized St. Juan Diego. 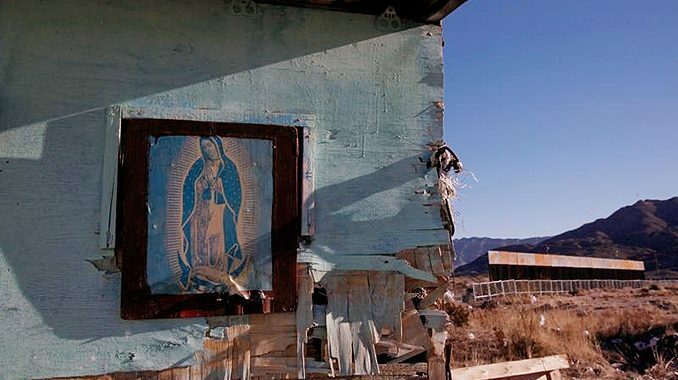 How Guadalupe came to the U.S.
One of the strongest places of devotion to the Virgin of Guadalupe, outside of Mexico, can be found in the United States, where shrines, seminaries, and parishes bear her name. “Over the past few decades devotion to the Virgin of Guadalupe in the U.S. has spread beyond parishioners of Mexican and Latino heritage to Americans of African, European, and Asian descent,” he said. The simplistic version of the story of how the devotion spread north is Mexican migration, Julia Young, an associate professor of history at Catholic University of America, told CNA. “Mexicans, whenever they came to the United States, brought their faith with them and their own religious identity and their own religious practices, and where they could, they found places of worship or they opened new places of worship. And often…they named them for the Virgin to whom they were most devoted – Our Lady of Guadalupe,” she said. “They’re not opening their own churches, they’re participating in existing churches,” Young said of Mexican emigrants. When Carl Anderson was named Supreme Knight of the Knights of Columbus Catholic fraternity in 2001, he brought the Board of Directors and the officers of the order to the Basilica of Our Lady of Guadalupe in Mexico City, in order to place the Knights under the protection and intercession of Our Lady of Guadalupe. “I wanted to emphasize the international character of her message, and the international character of the Knights of Columbus,” Anderson told CNA. He was also inspired by St. John Paul II, who called Guadalupe “an example of perfect inculturation and placed the entire hemisphere under her protection, so it seemed to me that this was the right thing for the Knights of Columbus to do,” he said. The Virgin Mary has often been invoked as a special protectress and patroness of priests. In Nebraska, at an international seminary for the Fraternity of St. Peter, the priests-to-be are under the patronage of Our Lady of Guadalupe, for whom the seminary is named. Valenzuela said that this patronage speaks to the “international character” of the Priestly Fraternity of St. Peter, which is a worldwide congregation of priests specifically formed and trained to celebrate the extraordinary form of the Mass. “Our Lady of Guadalupe from what I know is the only apparition of Mary where she’s pregnant, so what she does, what her full mission is, is to bring Christ into the hearts of man, and that’s what priests do, we bring Christ to other people,” he said. Her feast day at the seminary, which includes seminarians from South, Central and North America, is a full day of celebrations beginning with the liturgy and complete with pinatas, a Mexican feast, fireworks, and a mariachi band. “It’s a pretty big feast day,” Valenzuela said. Our Lady of Guadalupe has also been popularized as the patroness of the pro-life movement, particularly in the United States and Canada, “because she is a pregnant woman and she carries Jesus Christ our Lord in her immaculate womb, she is the patroness of life from the moment of conception,” Chavez said. “We live in a world in which child sacrifice, i.e. abortion, is embedded deeply in the substructures of our culture,” HLI President, Fr. Shenan J. Boquet, said in e-mail comments to CNA. Fr. 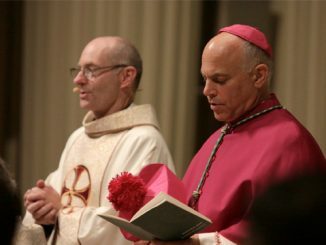 Paul Marx, O.S.B., who choose Our Lady of Guadalupe as patroness of Human Life International, did so because he saw devotion to Mary as “the solution” to moral decay, Boquet said. “In contemplating her simplicity we find the strength to emulate her faith, and proceed with confidence in the knowledge that God will overcome the seemingly insurmountable barriers looming over the world today,” Boquet said, quoting Marx. Chavez said the devotion to Our Lady of Guadalupe continues to grow and spread, and is evident in the variety of international pilgrims at her shrine in Mexico City. “That is why she is making a new civilization – of God’s love – where there are no borders or divisions, where we are all the one family of God. Her dark skin, her mestizo skin, also signals she is the mother of all people,” he said. Anderson, who co-authored a book on Guadalupe with Chavez entitled “Our Lady of Guadalupe: Mother of the Civilization of Love”, said that amid divisions and tensions in the U.S. and the world, the Virgin is ever urging peace and reconciliation. “She came at a time when there was a tremendous conflict between the Europeans that had arrived in the New World and the indigenous people, and her message was one of hope, reconciliation, unity, and healing,” he said. Valenzuela said the message of Our Lady of Guadalupe for Catholics today is also one of total confidence in the love and protection of Mary. A message encrypted in Our Lady’s appearances to Juan Diego is infancy, blood, and death. Aztecs sacrificed 1 per 5 infants to Satanic gods [they had a god of death] atop their foreboding pyramids of human sacrifice. Imaging according to narrator Leonardo DeFilippis Christ’s shedding of blood on Cavalry. Conquistador ruthlessness and Aztec cultural tether to the cult of human sacrifice made conversion extremely difficult for newly arrived missionaries. Appeal was made to Spain’s Monarch for intervention. Spain’s archives show many interventions by the monarchy often to no avail. Gold and Emeralds have a way of tempering Justice. Our Lady of Guadalupe answered the appeal and conversions probably the fastest largest in history began. Satan according to the Narrators including a CWR contributor whose name I forgot sought other avenue for murderous demonic sacrifice. Today 1 per 4 infants are aborted. We do well to appeal to Her once again. Our Lady of Guadalupe is the QUEEN OF THE AMERICAS not the Empress of the Americas.